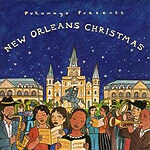 CD review: "Putumayo Presents New Orleans Christmas"
Rampart Street and Jackson Square don't exactly evoke Currier & Ives images of a traditional Christmas. But if far removed from the New England ideal of the winter holidays, New Orleans has carved out its own tradition  including a well-worn chestnut in "Christmas Time in New Orleans." No coincidence that that song is featured a new release of holiday music from the Crescent City. Putumayo World Music's compilation includes 11 songs from different artists. Ranging from the well-known (Ellis Marsalis, New Birth Brass Band) to the practically unheard-of (Papa Don Vappie's New Orleans Jazz Band, Big Bal Carson with Lars Edegran & his Santa Claus Revelers), this collection has as broad a musical palate as the city it is drawn from. Ranging from old-timey jazz to R&B to straight-ahead jazz to the blues, this set takes in just about every style you might hear in the French Quarter short of Cajun and zydeco. While every track is a gorgeous slice of the holidays with a New Orleans twist, it would have been nice to have had more of the big names that have defined New Orleans  a Louis Armstrong or Dr. John, Harry Connick Jr. or Fats Domino.